Another excellent piece in the Yellow Buttercup range of tableware from Carlton Ware. The buttercup range was first introduced around 1936 and appeared in two colours only - yellow as this one is and pink. 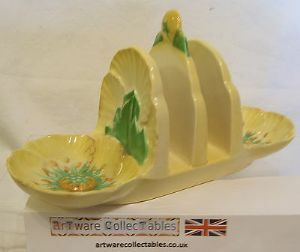 This very attractive 2-Slice Toastrack is in excellent condition. It measures 6.75 inches (17 cms) in length . There is no evidence of crazing. As with all this series, it is an Australian registered design and backstamped accordingly.